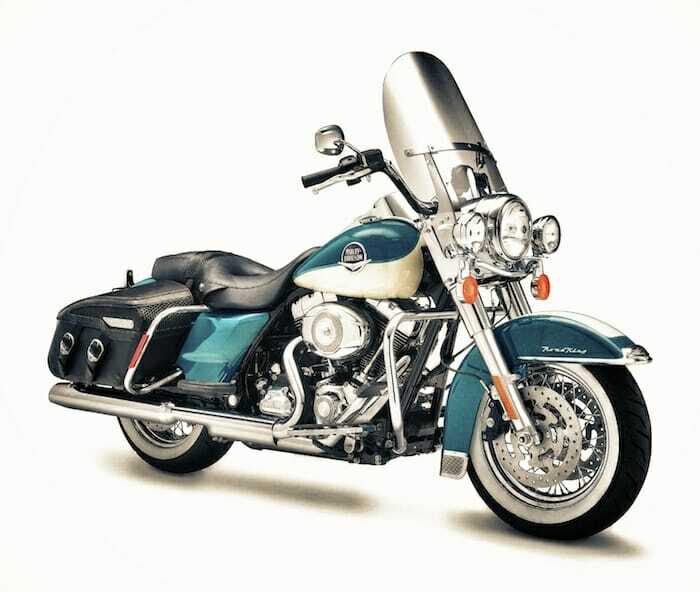 We LOVE the Harley Davidson Road King. Why? Well, we’ve probably logged more than 50,000 miles riding in America on Road Kings, and there’s just something about this bike that feels right. Maybe it’s the touring class frame, which provides superb and unique road feel. Maybe it’s the perfect, upright riding position, and the way the controls fall into your hand exactly as they should. We love the rubber mounted engine, which shakes like a Sherman tank at idle, then smooths out as soon as you start moving. We have so many fond memories riding Road Kings in California on Highway 1, or on the Blue Ridge Parkway thru Virginia. EagleRider has a load of Road Kings in their fleet beause they’re so popular. When it gets hot, we take off the easily removable windshield. The bike seems large parked, but it disappears beneath you as you ride, especially when the windscreen is off. The Road King will come with either hard or soft saddlebags, depending on the spec (Road King Classic gets soft bags which do not lock, the standard Road King gets the locking hard bags). Seat height is a low 28.1 inches, there’s a six speed gearbox and a six gallon fuel tank. The Road King is wonderfully no-nonsense: a beautiful vintage looking bike with minimal bells and whistles. We consider the Road King to be a bit of a purist’s bike amongst the Harley lineup. Passenger comfort is very good, with a wide pillion seat, floorboards and passenger grab rails just forward of the saddlebags. Luggage capacity is good for solo riders, and just OK for extended two-up touring. Again, we LOVE this bike; it’s versatile, cruises easily, provides good pillion comfort, and it’s surprisingly fun to do a bit of scratching on the Road King as well. One thing to be mindful of on the Road King Classic models (these usually are equipped spoked wheels that rehire tubed tires, it’s easy to tell the Classic because it’s got faux-leather saddlebags). We’ve gotten flats a few times on these bikes, because of pinched tubes or punctures. Tubed tires seem more susceptible to flats than tubeless, so don’t ride on the shoulder of roads where debris collects, as you’ll dramatically increase your chance of a puncture.